Modified Assured Career Progression Scheme for the Central Government Civilian Employees - Clarification regarding. Subject : Modified Assured Career Progression Scheme for the Central Government Civilian Employees - Clarification regarding. A joint committee is set up to examine the anomalies pertaining to the Modified Assured Career Progression Scheme (MACPS) vide Department of Personnel & Training O.M.No.11/1/2010-JCA dated 03-05-2010. 2. During the joint committee meeting it was pointed out by the Staff Side that the word 'new organization' of the last line of para 24 of Annexure-I of MACPS dated 19.05.2009 was not in consonance with the spirit of the Scheme. The issue has been examined and it is clarified that in case of transfer 'including unilateral transfer on request, regular service rendered in previous organization / office shall be counted alongwith the regular service in the new organization / office for the purpose of getting financial upgradation under the MACPS. However, financial upgradation under the MACPS shall be allowed in the immediate next higher grade pay in the hierarchy of revised pay bands as given in CCS (Revised Pay) Rules, 2008. Para 24 of MACPS stands amended to this extent. 3. The Staff Side also raised an issue on the 'benchmark' for MACP as given in para 17 of Annexure-I of MACPS dated 19.05.2009, which provides that the financial upgradation would be on non-functional basis subject to fitness, in the hierarchy of grade pay within the PB-1. Thereafter for upgradation under the MACPS, the benchmark of 'good' would be applicable till the grade pay of Rs.6600/- in PB-3. The benchmark will be 'Very Good' for financial upgradation to the promotion to the grade pay of Rs.7600 and above. It was pointed out that in some cases the promotion to the next higher grade was made on the basis of 'fitness' as the method of promotion as specified in the relevant recruitment rules, was 'non-selection'. Therefore, such cases benchmarks should not be insisted upon under the MACPS. The issue has been examined and it is clarified that where the financial upgradation under MACPS also happen to be in the promotional grade and benchmark for promotion is lower than the benchmark for granting the benefits under MACPS as mentioned in para 17 ibid, the benchmark for promotion shall apply to MACP also. 4. All Ministries/Departments may give wide circulation to the contents of this O.M. for general guidance and appropriate action in the matter. The issue is whether promotion earned in the previous unit should be adjusted against first MACP are not? Many are suffering and feel that they having got reversion to the lower grade the promotion should be ignored and what the MACP they get in the new organisationshould be treated as first. What should be the date of Vigilance clearance for grant of ACP/ MACP?. Shpuld it be the date from whcih the officer is getting ACP/MACP or the date of Meeting of DSC. I believe that the post of Stenographer Grade D should be rechristened as Junior PA or something of the sort and should be given grade pay of Rs.4200 in pay band 2. Stenographer Grade-III should be placed in pay band 2 with grade pay of Rs.4200/- as they also are performing duties at par with PS time to time, instead they are getting grade pay of Rs. 2400/-. This matter needs to be re-examined at par because injustice has been done by the 6th Pay Commission in case of Stenographers/ UDCs etc. We are being deprived of saying equal pay equal work. We are the worst sufferer. Stenographer Grade-III/Jr. Stenographer are very much sufferer as they have been granted the GP of Rs. 2400/- in the PB-1 of Rs. 5200-20200, the same Pay Band was also granted to the Class-IV employees. The pre-revised pay scales of 2550-3200, 2610-3540, 2610-4000, 2650-4000, 2750-4400, 3050-4590, 3200-4900, 4000-6000 has been merged in one Pay Band. As such the Stenographer-III and UDCs who are in the pre-revised pay scale of Rs. 4000-6000 are the most sufferer. They are required to be placed in PB-2. Further as mentioned the 6 CPC Report on pages 162-163, no guidelines have been issued to evolve the procedure for job enlargement/ enrichment towards unified cadre of Executive Assistant for all Stenographer cadres in non- participating Miniteries/ Organizations. What about the 3rd up-gradation under MACP Scheme who have completed more than 30 years service after getting promotion from lower grade and got only 2 up-gradations? Most humbly, I wish to state that I was appointed on the post of Superintendent Hostel and Guest House on 18.03.1987 in the pre-revised scale of 550-900 (5,500-9,000). I was granted Redeployment Scheme in the Scale of 6500-10500 in the year 1996. I was promoted as Section Officer in the regular scale of 6,500-10500 vide Office Order No.112 dated 8.9.2006 without any financial benefit. On the implementation of sixth pay commission, I was given grade pay of Rs.4,200 but latter employees in the grade pay of 6,500-10,500 (ACP or regular) were granted grade pay of Rs. 4,600 without benefit under FR22(I)(a)(1) vide Order F. No. 1/1/2008-IC, GOI, MF, DEIC dated 13 November, 2009. The post of Section Officer is a gazetted post equivalent to class B Officer and I am not getting bonus w.e.f. 08.09.2006 as admissible to other employees of the institute. The post of Section officer of A.G.; Punjab and U.T. 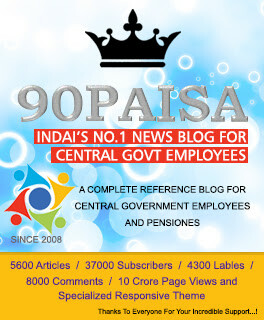 in which the S. O. is in the pre-revised scale of 6,500-10,500 have been granted grade pay of Rs. 4,800 on the date of elevation to the post of S.O. In my case too, I should have been given a grade pay of Rs. 4,800 w.e.f. 08.09.2006 as on my 1st promotion as Section Officer and grade pay of Rs. 5,400 as 2nd MACP on 1.9.2008, the date of MACP implementation, since, I have already served more than 20 years in the scale with one promotion after my open selection to the post of Superintendent Hostel & Guest House. Therefore, in the light of above, my case of granting 2nd MACP in the grade pay of Rs. 5,400 instead of grade pay of Rs. 4,800 may kindly be considered sympathetically. Respected viewers, I have joined as Constable in RPF on 05.02.2001 and got training for 09 month and posted on 17.11.2001. Now DG/RPF/NDLS has ordered that for LDC under rule 72 of RPF rule the person who have completed qualifying service of 08 years 10 years can apply for promotion even if their joining/training period also treated as qualifying service. But accordingly DG/RPF/NDLS has passed an same order for MACP also and there after cancelled his own order to get benifit of qualifying service for including Joining/training date for MACP scheme but for promotion the joining/training date will be included. Sir my simple question is that why partiality is being made by Railway Board for Promtion and MACP. Why clear instructions are not being issued in RPF. If any body can raise this issue then i will be ever greatful to him. Because the administration is not able to give promotion to all employees but can give benifit of MACP to 10, 20, 30 years completed employees including joining/training date in each case. Any one provide me the copy of O.M. No. 49014/3/2007-Estt (C), dated 18.10.2007, issued by G.I.Dept. of Per. & Trg. regarding the Limit on total number of days of leave in respect of Casual Labourers with temporary status. Sir, I have joined Central Government University on September 1997. I was promoted to the post of Sr. Assistant (Gr.Pay 4200) from Steno (Gr. Pay 2400) by passing departmental exam w.e.f. 24.06.2009 accordigly my pay was fixed by granting one increment from DNI in July 2009 as Rs. 14970/- and till now I am drawing my pay following that. Now after implementation of MACP since I have completed 10 years in 2007 so I have been given MACP financial upgradation from 01.09.2008 by granting next higher scale of Rs. 2800 since I was on Rs. 2400 gr. pay and accordingly my pay is being fixed from September 2008. Now on June 2009 I was promoted so only placement of Rs. 1400 i.e. difference of gr. pay amount will be given as per MACP rules and since this will be given in June 2009 so here it is being said that July 2009 increment will not be given. This is causing loss of pay w.e.f. July 2009 that I was getting till now. Please clarify me in this regard. I think there is a rule that under this circumstances my pay can not be reduced and loss of pay should be compensated with adding Personal Pay or like that. Please clarify me and suggest me at the earliest so as to help me . I joined central govt job on 30.10.2009 in G.p. 4200. Later GP was merged to 4600 GP. Now i want to know when i will get promotion in next higher GP. an official got a 2nd promotion after getting 3rd macp in same grade-pay and pay band of Rs.4800/-(pb-2).Will he get 3rd macp of Rs.5400/- in payband-2 after arriving 30 years of his service.